You have the ability to generate uplifting positive vibes whenever you want to change a situation, improve your life or simply just feel good. Once you’re aware of this ability you can use it whenever you want. It’s a simple, yet powerful, self improvement tool that can positively change your life around. I’m going to share with you exactly how you can use this powerful personal development tool to live a life you love. I’m even going to give you a FREE Personal Development Worksheet so you can explore the topic further. Keep repeating the same old pattern that makes you feel miserable? Sabotage your attempts to make positive changes? When you choose to ON PURPOSE to activate positivity it’s as easy as flicking on a light switch. You realise you want the light ON… and so you flick the switch. What happens in your mind and body as you flick the switch is absolutely fascinating. Instead of feeling tense muscles, feeling like everything or everyone is going against you, feeling frustrated that nothing is going right for you… you FREE FLOW through situations. You think quicker, have broader ideas, laugh often, attract the right people or event that you needed and you never feel stuck in life any more…. Because no matter what is happening in your life right now… you KNOW… you fully REALISE that you have the ability to change your life around any time you want to. So, you can live a life you love by activating positivity ON PURPOSE. First, identify the pattern of emotions, attitudes, behaviours and/or thoughts that is making you feel bad and that you want to change. Second, wait until that moment happens. Third, choose to activate positivity. Laughter Yoga or simply just laughing out loud for 10 minutes each day. Gratitude list – write down 10 things you’re grateful for every night before going to bed and being aware of how gratitude feels in your body. Thinking of someone you love and expanding that love to yourself and the world. Do this for at least 10 minutes each day. Download this FREE Personal Development Worksheet on How to Activate Positivity for more ideas. But also visit our Personal Development SHOP here and purchase a PDF book on Positivity or anything else that takes your fancy. Imagine feeling those uplifting positivity vibes whenever you want to. It’s absolutely blissful personal development! 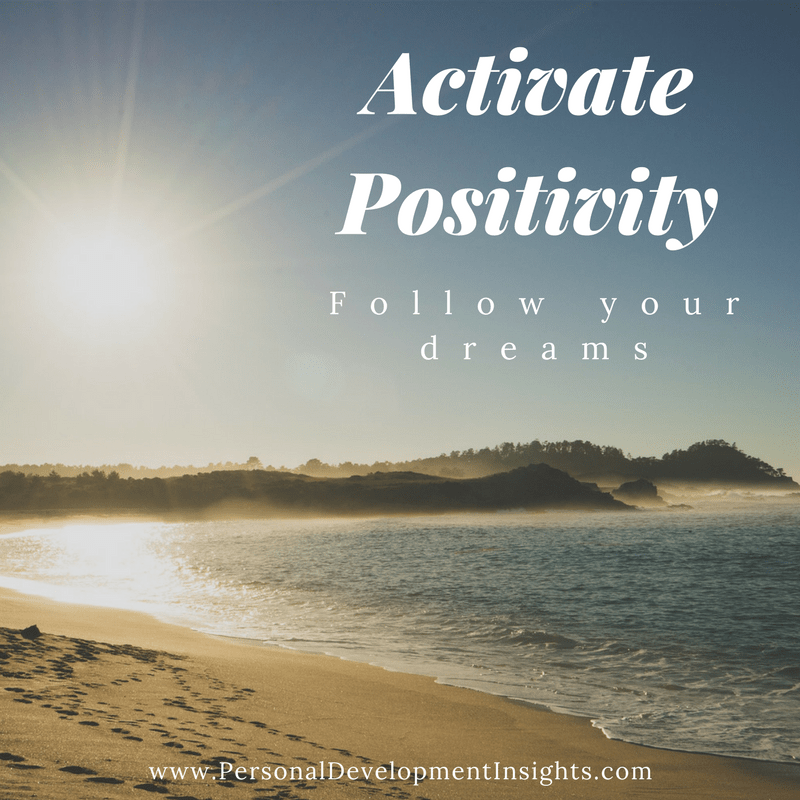 This entry was posted in Personal Development Resources, Self Improvement and tagged activate positivity, free personal development worksheet, live a life you love, personal development, positivity, self improvement. Bookmark the permalink.